Quit snoopin’ ’round my door. When she recorded ““Hound Dog”” Big Mama was a part of bandleader Johnny Otis’ Rhythm and Blues Caravan. Otis, as entrepreneur and a mainstay in the music business since the 1940’s, had brought Big Mama from Los Angeles to make a recording for the Peacock label. When he needed more material for the session, Otis called on two budding songwriters that he knew for help. Jerry Leiber and Mike Stoller were still in their teens when they compose the song that would help initiate the greatest cataclysm in popular music history. This songwriting duo went on to become phenomenally successful and wealthy from countless rock and roll and R&B hits, including Kansas City’s own anthem. When “Hound Dog” was finally released in 1953, it shot to the top of the R&B chart, but in spite of its success, Big Mama claimed that she only made $500 from her only number one hit. Of course, anyone who professes ignorance of the eventual fate of “Hound Dog” would have to have been the denizen of a dungeon for the past 40 years! The usually loving and forgiving Big Mama was understandably bitter over the incredible sales of Elvis’s more insipid and sanitized 1956 version for RCA. Johnny Otis claimed that Lieber and Stoller had promised him and Big Mama a share of the composer credits for their contributions to the lyrics of the song but they reneged, and the ensuing lawsuit resulted in a permanent rift between Otis and the songwriters. Willie Mae Thornton was from Montgomery, Alabama, where she was born on December 11, 1926. Her father was a minister and her mother was a church musician so, naturally, the girl’s first musical influences were of a spiritually inspired nature. Eventually her aspirations grew beyond the church and she started claiming prizes in local blues contests. The death of her mother curtailed Willie Mae’s musical activity for a while because she had to go to work full time to help support the family. But by 1939, she was into show business professionally as a singer and dancer with Sammy Green’s Hot Harlem Review from Atlanta. This was one of the many traveling troupe of African – American performers who provided entertainment for black audiences in those days of segregated America. In 1948, she left of the Harlem Review in Houston, Texas, where she found a steady work as a nightclub singer. One night, Johnny Otis caught her act and he immediately invited her to join his Rhythm and Blues Caravan. At her debut with Otis’ group at Harlem’s famous Apollo Theater, Otis introduced her for the first time as Big Mama, a stage name that, if not flattering, was fitting for imposing 300 pound frame, and it stuck with her for the rest of her career. Big Mama sang with a powerful voice in the manner of the earlier classic women blues singers, such as Bessie Smith, Ma Rainey, and especially Memphis Minnie, whose style she most closely emulated. The normally tough Apollo audiences were taking in by Big Mama’s magnetic energy and stage presence, and Otis made her the shows headliner for the rest of their engagement at the Apollo. After her triumph at the Apollo, Big Mama joined Johnny Ace, this smooth singing R&B crooner who had a string of hits in his short career, including the memorable “Pledging My Love.” Sadly, the association came to an end on Christmas Eve of 1954, we end, during the intermission of a concert in Houston’s city auditorium, and Johnny ace put a bullet through his head in a senseless handling of a supposed unloaded gun. Throughout the 1950’s, Big Mama continued to draw crowds and appeared with Junior Parker, Bobby Blue Bland, Gatemouth Brown and other major blues musicians. She taught herself to play drums and, with some help from Parker, she also mastered the harmonica, frequently playing both instruments during her performances. By the end of the decade, however, rock and roll began to take its toll and Big Mama’s popularity began to fade. She left Houston in 1957 and moved to San Francisco, where she sang and played drums and harmonica, mostly in small clubs in the Bay area for the next 6 or 7 years. However, with the renewed interest in the blues sparked by the ‘60’s folk movement, Big Mama’s lot began to improve. 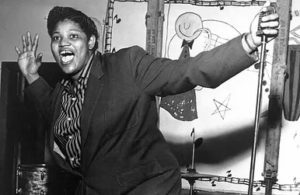 An acclaimed appearance at the 1964 Monterey Jazz Festival and the craving by the folk revival audiences for more and more blues artists allowed a Big Mama to land a steady succession of gigs at festivals, college concerts, and coffeehouses. She was chosen to appear in the 1967 “From Spirituals To Swing” concert at Carnegie Hall, and she was included in both the 1965 and 1972 American Folk Blues Festivals that toured England and Europe. Arhoolie records became interested in Big Mama, and they actually made their first recordings of her while she was still in Europe in 1965. Mama recorded steadily until the end of her career, not only on Arhoolie, but also on Vanguard, Mercury and several smaller labels, producing some excellent sides, but never a solid hit. Janis Joplin’s 1968 hit recording of Big Mama’s “Ball And Chain” was a great source of pride for Big Mama, and she always expressed the highest regard and admiration for the young singer. Big Mama continued to perform into the ‘80’s, but for several years for health had been failing due, at least in part, to a lifetime of a copious consumption of whiskey. By the time of her death from a massive heart attack in 1984, the great woman that weighed less than 100 pounds.